We are only three days away from the big day! All the new stamps and Die-namics will be available on Tuesday, October 9 at 10:00am EDT. Be sure to check out the MFT Blog to see all the new items being revealed today. Don't forget to leave a comment on the MFT Blog countdown posts, YOU could win one of the five $75.00 gift vouchers. My card today features the gorgeous Hand-Lettered Holiday Greetings stamp set. 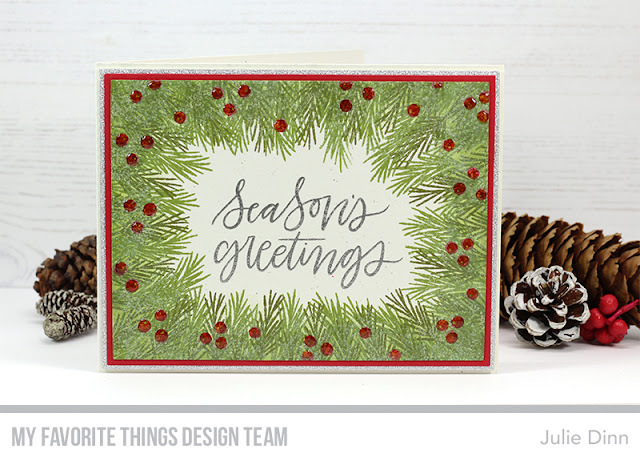 This set is full of beautiful holiday sentiments and a few pine boughs. I stamped the sentiment in Versamark ink and embossed it with the Silver Embossing Powder. Next I stamped the pine boughs in Peeled Paint and Forest Moss Distress Ink. I added a bit of Sweet Tooth Pigment ink on top of the pine to look like snow. The berries were stamped in Wild Cherry Ink, and I added a touch of Glossy Accents on top of the berries to make them shine. How easy this can be, and how elegant it looks. You've done a fine job. Very lovely card. I loved all of the fact that your Sentiment was the focal point of this card...softened by the pine boughs....loved it! Beautiful foliage and berry combination with the silver colored greeting! So pretty! The red berries look really great! Great card - love how the sentiment is so nicely framed.